Okay, it's finally time for round two of our denim picnic blanket project. I meant to have this up Monday morning, but I ran out of jean thread over the weekend and it set me back a couple of days. 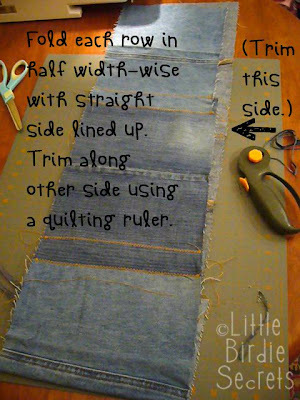 So that's my first tip--make sure you have enough jean thread! I didn't realize my spool only had 70 yards on it. I assumed it was the same size as my 250--500 yard spools. Plus, the zig-zag stitch we'll be using uses a lot of thread. In total I used about 300 yards, so be sure to stock up so you don't get stuck like me! My second tip is avoid stretchy denim. I used one pair that was pretty stretchy and it was hard to work with. Not impossible, but annoying. So if you have a choice, don't use it! If you're just joining us on this quilt-along, check out the supply list and part 1 of the instructions. For the rest of you, here we go! *Your denim blocks, "squared up"
1. The first thing I did before sewing my blocks was lay them all out on top of my tablecloth in a pleasing manner. Make sure they each overlap the blocks on all sides of them 1.5 inches. Use the shortest block on the row to determine if that row will be tall enough. If you do this and there is tablecloth showing, add more blocks. I also recommend 3-6 inches overhang on the edges, just in case. You can always trim it away, but it's a lot harder (and annoying--I know firsthand) to add more blocks later. 2. It's time to sew your first row! Take two blocks that are next to each other (horizontally) and overlap them 1.5 inches, lining up either the top or bottom edge (it's okay right now if the top edges don't match up). Pin. 3. Stitch right down the middle of the overlap seam using a zig-zag stitch. I just left my stitch settings at my normal length (2.5) and width (5). But you might want to experiment on a scrap before starting your blocks. 4. Flip the block over and stitch down the other seam. 5. Continue adding blocks, always lining up the next block with the same edge. This means you'll only have to really trim one edge when the row is done. Here's another example. See how the bottom edge is lined up, but the top is not? 7. Once all your rows are squared up, lay them out on your tablecloth again to make sure they cover the whole thing. Now it's time to sew your rows together. Repeat steps 3-6 to sew each row to the next. This gets a little trickier since the quilt is now getting pretty big, so go slow. 8. When you have them all sewn together, square the sides up like before. Then lay your quilt on top of your tablecloth to make sure it's big enough. Mine is close enough. If the tablecloth is still really showing when I'm done with the binding, I may borrow Stacy's serger to shorten the tablecloth. 9. The last step of part 2 is to sew on your pockets (optional). Lay your pockets out on your quilt the way you want them. Pin in place. Using your jean thread again, stitch around the outside of each pocket, leaving the top open if you want to be able to put napkins, silverware, etc. in them. Or you can sew them shut. I know that rocks and dead flowers will be found in mine later, but I still chose to leave them open. I just used the original stitches as my guide. Because the blocks are so large this quilt comes together pretty quickly. But getting working on it now so you'll be ready for part 3! I love, love, LOVE your site! You have such great ideas. I tried your valentine wreath, and it turned out gorgeous. I did it for my "pay it forward" post, and it is now going to three beautiful ladies. So this might just be the best looking denim blanket I have ever seen! Nice job! I have a question. After #6 when you start sewing your rows together, is this done with a straight seam (as you'd use in normal quilt rows) and did you sew the seam once or twice as you did when putting the "blocks" together. Did you press to one side? I can imagine there would be a lot of bulk with two layers of jeans and the side seams of those jeans. Thanks for a great project. I enjoy the idea of sewing together....more motivation to get the job done! Oh shoot, I was worried this might not be very clear. Let me see if I can clarify. There should not be any seams to press open. You sew the rows together like you did the initial blocks to make the rows. Lay one on top of the other, overlapping 1.5", and zig zag down the front overlap. Then turn it over and zig zag stitch down the back side overlap. It will be flat on both sides--no seams to press open. Hope that helps! I love your site. I stumbled upon it yesterday and I am thrilled. I have a question regarding the denim picnic blanket. If I were doing smaller blocks do I need to overlap them 1.5 inches or could the overlap be less? On the big blocks it looks great, but I already have some smaller squares cut and would love to use this piecing technique.